ScottieWanders: Good news about Evader! I actually got a phone call from the Marine Mammal Center to let me know that Evader was successfully treated and has been released back into the wild! They thanked me for getting in touch with them when I spotted the injured animal, and said that such reports from the public helped them track and eventually capture and treat the pup. 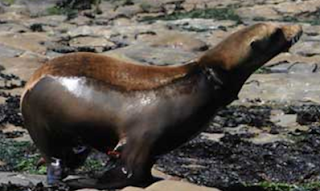 Great news for sea lions, and terrific public relations for a non-profit organization!